was the armed force of the anti-fascist movement of resistance in occupied Yugoslavia, led by the Communist Party of Yugoslavia (Yugoslav National Liberation Army, NOVJ), the full name of the National Liberation Army and Partisans of Yugoslavia (NOV and POJ), the shorter and more popular partisans. Yugoslav Partisans considered being the most successful movement of resistance in occupied Europe. 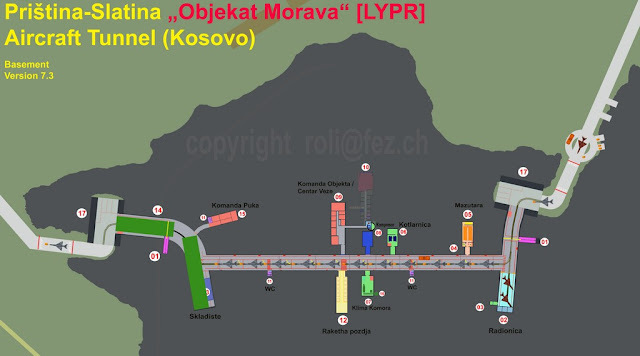 NOVJ was formed in June 1941 by the formation of the first Partisan detachment. March 1, 1945, has grown into the Yugoslav army, the regular military formation of the Democratic Federal Yugoslavia. 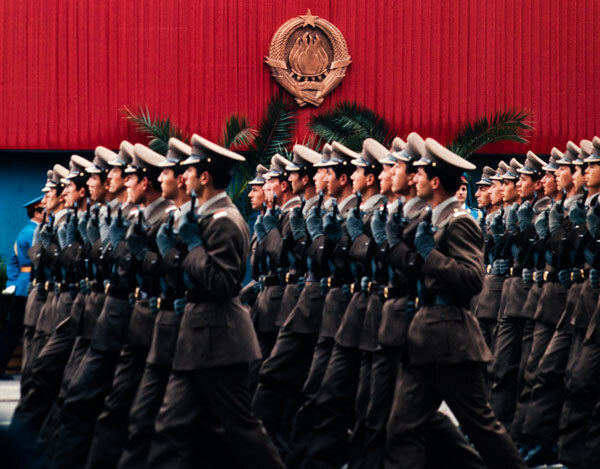 The National Liberation Army was headed by the Supreme Staff, and its members were called Partisans. The Partizan strategy rejected the holding of the fronts. At the beginning of the war, they did not manage to deal with the strongest and most savage world armies, without heavy weapons, mechanized units, and aviation. The forces of NOVJ fought in complete rounding up of the enemy, with no help on the side, until autumn of 1943. 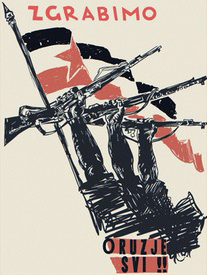 To arms, everyone!, a Partisan propaganda poster. The occupiers and their associates were aware of the forces that the partisans represented and tried to destroy them in countless anti-partisan operations, most notably the seven major offensive. The biggest offensive was the combination of Wehrmacht, SS, Fascist Italy, Bulgaria, Ustasha, and Chetniks. Although according to the German report, there was a strong military formation that fought against the Axis Force in the Balkans, the allies were accepted only in the second half of 1943. Partizan's only source of supply was looting from the enemy, until 1944 when the help of the British began to reach the prime amount. According to German estimates, the forces of the Yugoslav partisans in October 1943 numbered about 100,000 people. In October 1944, NOVJ had 18 corpses with 50 divisions and about 500,000 armed combatants. These forces were associated with six German corpses, 19 German divisions, 24 German regiments, Ustasha-domobran and Chetnik units, about 1,100,000 enemy fighters. Since autumn 1944, the Yugoslav army was holding his part of the Allied front in Europe, between the Red Army in Hungary and western allies in Italy. The Yugoslav Army in the Homeland (abbreviated JVO or JVUO) was a military formation under the command of Drage Mihailovic, created by connecting Chetnik units throughout occupied Yugoslavia. It was created by a decree of King Peter II on June 10, 1942, and dissolved by a decree of 29 August 1944. 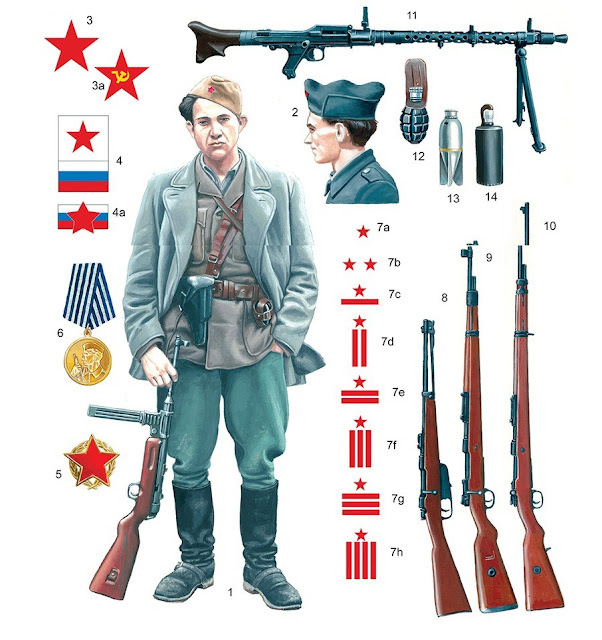 Yugoslav Army in the Homeland was established as pro-Serbian royalist guerrilla organizations in order to fight against the invading forces of the Axis. 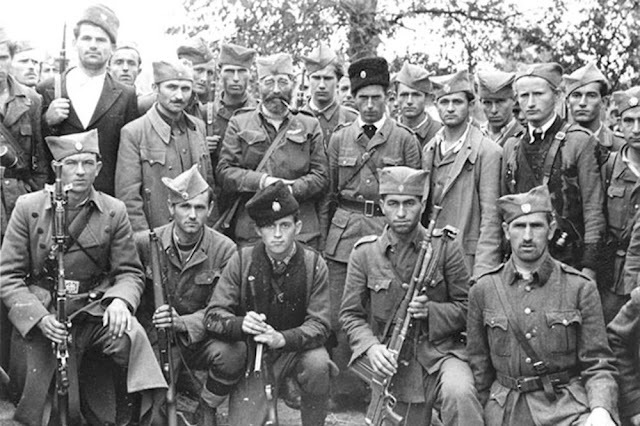 The first Chetnik detachments are at Ravna Gora in May 1941, organized by soldiers and officers who escaped capture, and some members of the prewar Chetnik movement. In November 1941, the Government of Yugoslavia in exile gave legitimacy to a group of Chetniks, led by Colonel Mihailovic. The Government of Yugoslavia in exile was supported by the Allies, and the Chetniks of Draza Mihailovic formally became part of the allied coalition. The United Kingdom Army and the United States have established official relations with the Chetniks. JvuO acted like a conspiratorial organization. Although many Chetniks were "legalized" by the occupiers, they maintained contacts with General Mihailovic, received orders from him and submitted reports to him. Despite the Allied support, resistance to Axis is really fallen, and many parts JVuO began to collaborate with the Axis forces against the rival National Liberation Army of Yugoslavia. According to the Momcilo Dujic, in mid-1942 between the Chetniks in the Independent State of Croatia was 12 240 "anti-Communist volunteers" in the service of fascist Italy. Following a series of warnings during 1943, the Allies issued a decision on termination of cooperation in December 1943. 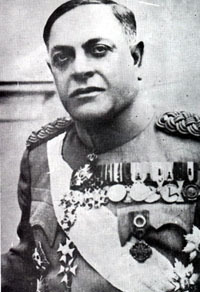 The outgoing government in which Mihailovic was the minister was disbanded in May 1944, and King Peter II abolished his staff in August 1944 and invited all members to join the Yugoslav National Liberation Army in September. Armed Forces in the Homeland ... General Draza with the Chetniks in 1944. 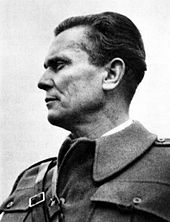 In 1944, Mihailovic dismissed obedience to the King of Yugoslavia, who commands putting JVUO under the command of the NWJ, and during the Allied Battle of Serbia for 1944, he fights on Wehrmacht's side. After the withdrawal of the Germans, the National Liberation Army of Yugoslavia soon succeeded in defeating the remains of the Yugoslav Army in the Homeland in 1945. 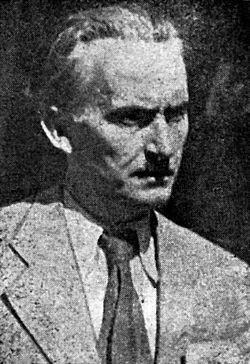 Ustaše was an expression that was colloquially marked by members of the Croatian fascist movement founded in 1929 by Ante Pavelic under the name Ustasha - Croatian Revolutionary Organization (UHRO). In 1941, after the founding of the Independent State of Croatia, Nazi Germany set up for the ruling party called Ustasha - Croatian Liberation Movement (UHOP). The Ustasha movement also had its own paramilitary formation in the NDH, the name Ustasha Soldier, which was established according to the order of Pavelic 10.5. 1941. In 1944 it was formally integrated with the Croatian Defense Forces into Croatian Armed Forces (HOS). 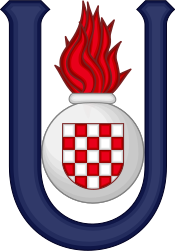 The symbol of the Ustaše was a capital blue letter U with a flaming grenade and Croatian emblem within it. 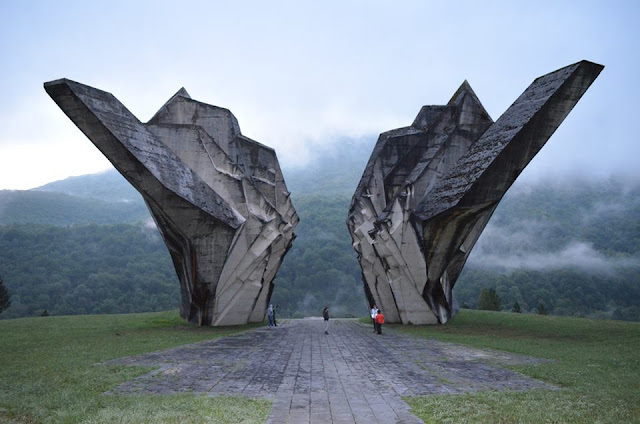 The NDH collaborated with the Italian and German occupation forces in Yugoslavia in fighting an increasingly unsuccessful campaign against the resistance forces, the Yugoslav Partisans, who were recognized in late November 1943 as the military of the Allied Yugoslav state. As German forces withdrew from Yugoslavia in 1944–1945, the Ustaše organized an exodus from the country, which led to the Bleiburg repatriations. The Serbian Volunteer Corps (German: Serbisches Freiwillingenkorps) was a military formation that during the Second World War in occupied Serbia under the command of Wehrmacht led the struggle against the Partisans. In October 1941, Dimitrije Ljotić, leader of the Patriotic Movement "Zbor", formed a party army - the Serbian Volunteer Command, with about 2000 volunteers, which was renamed in the Serbian Volunteer Corps (SDK) by the end of 1942, 9,000 volunteers well armed. Members of the corps were convinced patriots, popularly known as ljoticevcima by its ideologist Dimitri Ljotic. 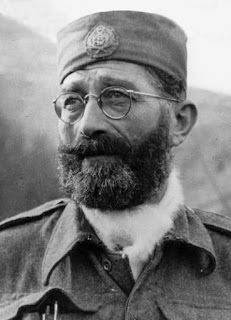 Commander of the Serbian Volunteer Corps was Colonel Kosta Mušicki. Ljotic's volunteer detachments were the party army of the ZBOR, which consisted mainly of young pro-Serb volunteers. The ideology of the Ljoticevac predicted the fight against Freemasons, Jews, Communists, Western capitalism and attachment Serbia to Germany. 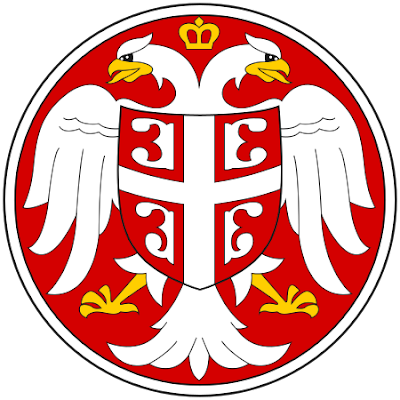 Serbian State Guard (known as Nedic) was a quisling formation in occupied Serbia, founded on March 3, 1942. Ever since its inception, in the fall of 1941, engaged in the fight against the Partisans. There were about 17,000 people January 1943, there is a record number of 36,716 people including auxiliary services and an armed village militia. In addition to regular police duties, members of the Serbian State Guard have carried out mass shootings Banjički concentration camp prisoners, including a large group of women. The war engagement ended in Italy, where the Allies disarmed them.